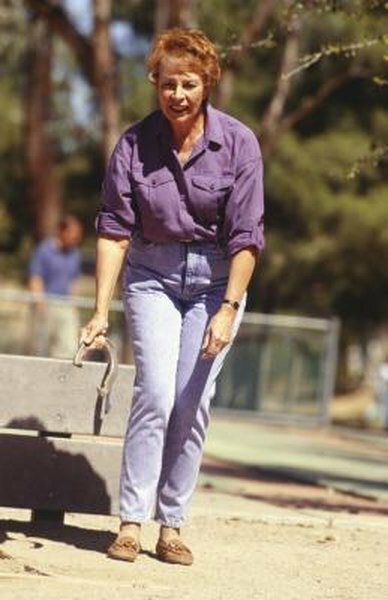 Although it is a popular backyard recreational activity, the game of horseshoes is taken very seriously across the United States and the world. In fact, the National Horseshoe Pitchers Association has established official rules governing the game, including scoring rules, which are used in competitions and tournaments across the country. A few different scoring formats are used in horseshoe competitions. The object of the game is to throw a horseshoe close to or around a metal rod sticking out of the ground about 40 feet away in order to score points. In official competition and tournament play, a horseshoe that comes to rest 6 inches or closer to the stake counts as one point. A horseshoe that comes to a rest leaning on the stake also counts as one point. A horseshoe “ringer” is one that comes to rest around the stake. Ringers are determined by placing a straight edge -- such as a ruler -- across the feet of the horseshoe. If the straight edge touches both shoes without touching the stake, it is ruled a ringer. Ringers count as three points in the game of horseshoes. Each competitor throws two horseshoes within an inning. Players compete either until one player reaches a certain number of points, or a certain number of innings have been played. In cancellation scoring, only one player can score each inning. Cancellation scoring involves canceling any equal number of ringers scored by both players within one inning. For example, if player A scores a ringer on his first toss, and another ringer on his second toss, followed by player B throwing a ringer on her first toss and a non-ringer on the second toss, player A’s first ringer is canceled out by player B’s ringer. Player A would receive three points for the inning. If there are no ringers within an inning, the closest shoe to the stake scores one point. If Player A has two shoes closer than Player B, she would score one point for both shoes for a total of two points. If both players throw shoes of equal distance to the stake, neither player scores. In count-all scoring, all points scored by both competitors are counted each inning. This means that, for each inning, each player has the opportunity to score anywhere between zero to six points for the inning. One variation of count-all scoring includes “ringers only” scoring, in which only ringers result in points for players. In this method of scoring, each ringer counts as one point, meaning players can earn either zero, one or two points per inning.